"I got this recipe from a family member and it has been a favorite since. It is so simple to make, but is definitely a crowd-pleaser! With the majority of the ingredients being fat-free, it is one that you make and not feel guilty about serving. My kids ask me to make it every time we go to any type of gathering, and when I bring it everyone says they love it." 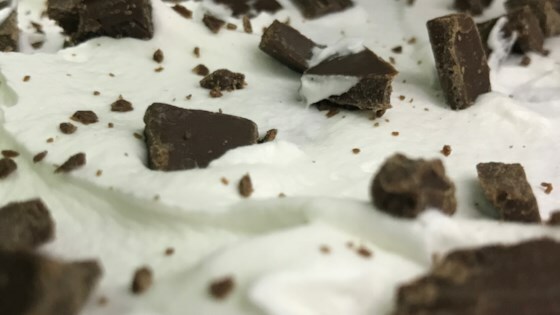 Whisk white chocolate pudding and skim milk together in a bowl until thickened and smooth; fold in 1 tub whipped topping. Line a 9x13-inch casserole dish with 1 layer of graham crackers. Spread 1/2 the pudding mixture over graham cracker layer. Repeat layering with graham crackers and remaining pudding mixture, ending with a layer of graham crackers. Spread 1 tub whipped topping over top graham cracker layer; sprinkle with candy bar pieces. Chill in refrigerator until set, 2 to 4 hours. You can use any type of candy bar in place of the Hershey's® milk chocolate bar. Store-brand graham crackers will get softer faster and should not be left in 4 hours. Loved this recipe. I won first prize with this at the church cook off. It is going to become one of my "go too" pot luck recipes. This is just as good as everyone says. It's easy and would be a hit at any gathering. I used chopped bitter chocolate chips on top. Delicious,made it for my brother,loved it!